Magnuson Park was previously the Sand Point Naval Air Station. 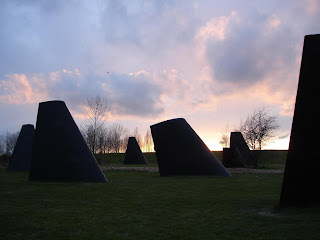 And there are a field of real submarine fins there. In the foreground sits a fin of the USS Puffer (SSN-652), a Sturgeon-class nuclear sub. The glowing guts of this sub (and many others) are rotting in the open air in Hanford WA now.